This PDF 1.4 document has been generated by PScript5.dll Version 5.2.2 / GPL Ghostscript 8.15, and has been sent on pdf-archive.com on 04/07/2012 at 19:24, from IP address 27.97.x.x. The current document download page has been viewed 493 times. File size: 153 KB (1 page). receive very high publicity and acquire very high reputation. that is useful for society. upon receiving the final versions. peer review process. Submitted papers should not have been previously published or be currently under consideration for publication elsewhere. • Response will be given within 12 hours of submission. 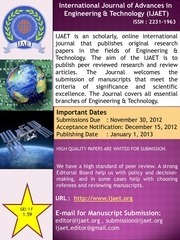 • The paper will be reviewed within one week of submission. • Author will get their Acceptance/Rejection Notification within 10 days of submitting paper. This file has been shared by a user of PDF Archive. Document ID: 00041497.